Original air date on Thumbin Radio – Saturday, April 26, 2013. Broadcast the day after George Jones passed away, Greg Lonesome pays tribute to the “greatest singer in country music history”. Digging deep into Jones’ catalog, Greg plays cuts that you likely won’t hear any place else. Enjoy. The post Honky Tonk Hardwood Floor 5 appeared first on Thumbin Radio. Greg Lonesome spins 2 full hours of murder ballads & creepy country/folk songs and gives some background as to where some of these songs came from. Originally broadcast on Thumbin Radio at ThumbinRadio.com on March 30, 2013. The post Honky Tonk Hardwood Floor 4: Murder in the Country appeared first on Thumbin Radio. Original broadcast on Thumbin Radio: March 2, 2013 Greg Lonesome returns for yet another great show. Honky Tonk Hardwood Floor Show 3 is dedicated to early Willie Nelson and David Allan Coe. That’s right – Greg plays nothing but Willie and Coe. Play this one loud! 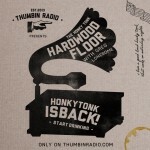 The post Honky Tonk Hardwood Floor 3 appeared first on Thumbin Radio. Originally broadcast on ThumbinRadio.com on February 16, 2013 A special post-Valentine’s Day edition of the Honky Tonk Hardwood Floor, featuring songs about being lonesome and/or lonely. Grab yourself a stiff drink and cry your eyes out… Or, better yet, enjoy two hours of great country music with real, palpable feeling in it. The post Honky Tonk Hardwood Floor 2 appeared first on Thumbin Radio. The post Honky Tonk Hardwood Floor 1 appeared first on Thumbin Radio.